Located in Rotorua, Tihi Retreat is in the suburbs, a 4-minute drive from Te Puia New Zealand Maori Arts and Crafts Institute and 12 minutes from Redwoods Whakarewarewa Forest. Featured amenities include dry cleaning/laundry services, luggage storage, and laundry facilities. A roundtrip airport shuttle is complimentary (available 24 hours). Located in Kaikoura, The Point Bed & Breakfast is in a rural location, a 1-minute drive from Fyffe House and 5 minutes from Kaikoura Beach. Free self parking is available onsite. With a stay at Mountview Bed & Breakfast in Tauranga, you'll be within a 15-minute drive of Tenpin Tauranga and Tauranga Golf Club. Free self parking is available onsite. 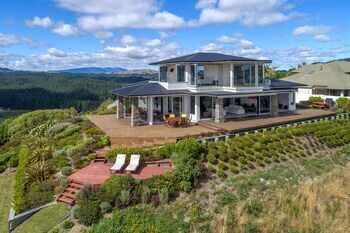 Located in Tauranga, House in Bethlehem is within a 5-minute drive of Fernland Spa and Mills Reef Winery. Free self parking is available onsite. Located in Queenstown, this vacation home is a 5-minute drive from Lake Wakatipu and 5 minutes from Crown Range. Free self parking is available onsite.